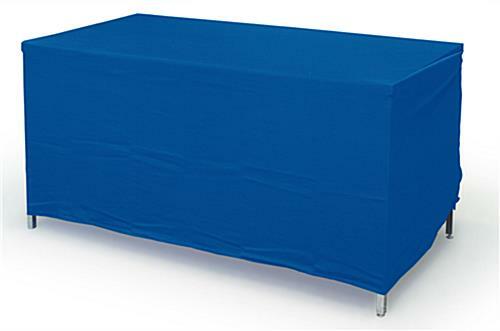 This Wholesale Table Skirt In Stock is Perfect for the Busy Trade Show Presenter! 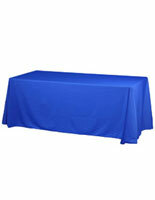 This Tablecloth is Ready to Ship Now! 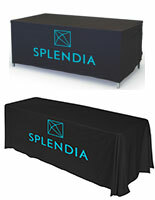 Stop worrying about the size table will be supplied to you by a trade show decorating company! 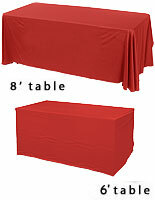 This convertible table skirt ensures you always have the right sized table cover. 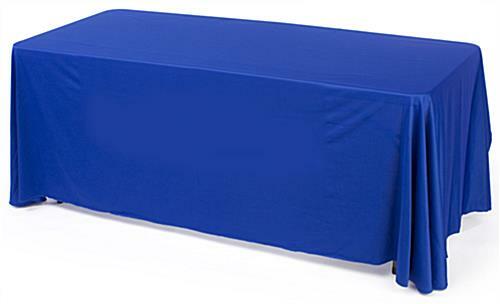 Each tablecloth, convertible table skirt is fabricated of royal blue polyester cloth that is both machine washable and dryable. The wrinkle-resistant polyester fabric is also flame-retardant and comes with a certificate from an independent testing laboratory to prove it. 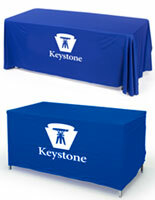 A convertible table skirt is ideal for trade shows, conventions, fairs, hotels and more. 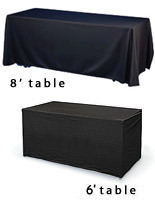 This convertible table skirt is specially made to fit 8' wide tables, yet is easily modified for 6' tables. 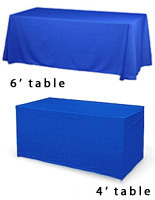 A convertible tablecloth, also known as a table throw or cover, is made with sewn-on hook and loop tabs that allow it to be easily adjusted to fit the smaller sized tables. To do this, just fold the side panels inward and fasten into place with the pre-attached hook and loop tabs. 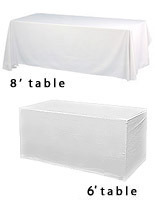 This modifies your four-sided draping table skirt into a fitted table cover in just a few minutes. What a great idea for those that attend a log of conventions or other promotional settings throughout the year.